We met at Colette's home. Thank you Colette for great hors d'oeuvres and a great choice of wines! Thanks to Dan for a wonderful wild blueberry pie. Members present were Beth, Carla, Colette, Janet, Jolene, Linda, Michèle and Shirley. 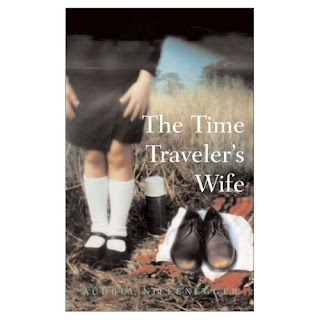 The book discussed, The Time Traveler's Wife by Audrey Niffenegger was Carla's choice. Ms. Niffenegger is a professor in Fine Arts at Columbia College Chicago Center for Book and Paper Arts. This is her first novel that took her 4.5 years to write. Reaction to the book was mixed. Some members very much enjoyed the book and others much less. Some had difficulty following the timeline of the story with Henry moving back and forth in time. One member felt like she was reading a textbook. Carla and others felt that there is significant character development. We know what type of music they enjoy, what food they prefer. There is considerable description of their environment, where they live, the decor, etc. Janet liked that it portrayed a feeling of longing. We often have feelings of longing for past experiences and emotions. It also reminded her of dreaming and dreams we may have of close family members who are no longer with us. Colette felt that there was portrayal of "loss of love". Ingrid cannot deal with the loss of Henry's love and commits suicide. Henry's father Richard is unable to move on after the death of his wife. Colette felt the book did not portray a message of hope, that ultimately all love is lost in the end. However, Michèle pointed out that the ending gives the impression that Henry comes to get Clare to continue their life and love in the afterlife. Though feelings about the book were decidedly mixed, all felt that it was an interesting concept. For those who enjoy Time Travel stories, Beth suggested, the movie, Somewhere in Time with Jayne Seymour and Christopher Reeves and the book by Robert Nathan or movie directed by David O. Selznick Portrait of Jennie.